If you are waiting for the right time to invest in the market, that time is now. The S&P 500 Index is at an all-time high, traditional market valuation metrics such as price-earnings (PE) ratios are above their long-term averages, and the United States market is already in its ninth bull year, the second longest bull run in history. The PE ratio values a firm by measuring its share price relative to its per-share earnings. Many people I've spoken to say they are worried about the level of the market and fear that a crash is coming, so they are holding on to cash for now. If you are doing the same thing, I certainly understand the sentiment. Nobody wants to go into the market at the wrong time and lose money. But let's play this scenario out. Let's imagine that you do invest now, when markets are high, and within a few months, we experience a US market crash that is the worst seen in almost 100 years, with some analysts saying it could turn out to be even worse than the Great Depression. Let's say you have the fortitude to stay invested and do not pull out any of your investments. A few years later, several European countries get close to defaulting, and more than a few analysts comment that this may lead to a crisis that is even worse than the one before it. You stay invested. Then a few years later, China's stock market goes into a meltdown, leading to a global market rout. Still, you stay invested. It is hard to imagine a scenario that could be worse than what I've described above. Yet you've probably realised that this is exactly what investors would have gone through if they had invested during the great financial crisis in 2007-2008. How would an investor have done? From the beginning of 2008 until the end of last month, a globally diversified equity index such as the MSCI All-Country World Index had gone up by 48.74 per cent, or 4.15 per cent a year. That doesn't sound so bad, does it? But wait, you say. That time was different. The world is a different place now. It is possible that the market will crash soon and be even worse than what we have gone through over the past 10 years. A few famous experts have also said the same thing. Yes, that might happen of course. But what if it doesn't? It wouldn't be the first time that experts got their predictions wrong. What if the market continues to go up by 30 per cent over the next few years, then declines by 10 per cent and then resumes climbing? If you had stayed in cash in this scenario, you would have missed out on a lot of gains, and you would have lost valuable time to grow and compound your money for your retirement years. Waiting for a crash that never comes can be very expensive. To illustrate just how expensive a mistake that can be, let's rewind to 2011. At that time, due to the European debt crisis, a famous investor said the markets were definitely going to crash within a year or two, and that it would be much worse than in 2008. So if you had held cash since 2011, the opportunity cost would have been staggering. The benchmark Straits Times Index (STI) has since delivered 46.26 per cent, or 6.54 per cent a year. A globally diversified equity index such as the MSCI All-Country World Index has gone up by 111.93 per cent, or 13.33 per cent a year. Instead, your savings would have earned about 0.05 per cent in a typical bank account while being eroded by inflation. So if you had $100,000 in your savings account in 2011, you would have earned a compounded return of $300.38 after six years. 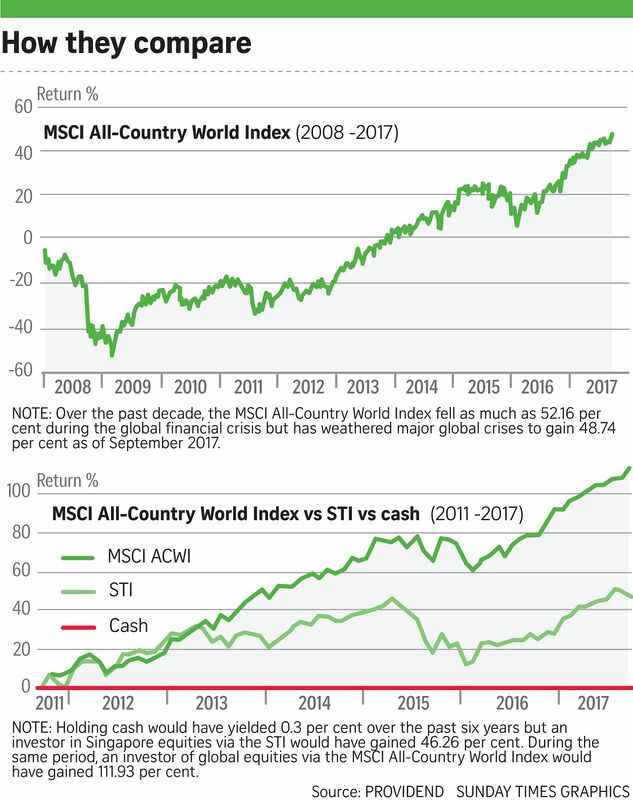 In contrast, the STI would have given a return of $46,243.36, and the MSCI All-Country World Index would have earned you $111,869.94. Multiply that amount with respect to how much you actually held, and you have a rough idea how costly it would have been to stay in cash. I wrote earlier that the time is right to be invested because to invest or not to invest is not a binary decision. You don't have to go all-in or nothing. Just as there is a risk in investing, there is a risk in not investing. It would be more prudent to invest a portion of your cash holdings into a portfolio that fits your need, ability and willingness to take risk - a portion that would allow you to sleep at night, while mitigating the risk that you could be wrong about a market crash. •The writer is a portfolio manager with Providend, a fees-only financial advisory firm specialising in retirement planning.